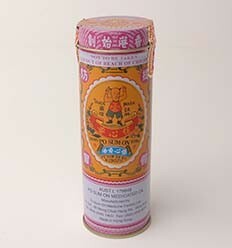 A traditional Chinese medicine for the temporary relief of minor aches and pains of muscles and joints associated with simple strains, bruising and sprains; for the temporary relief of chest discomfort caused by bronchial cough. Indicated for use in idividuals with Liver Qi stagnation. May help provide symptomatic relief of mild pain in the abominal muscles induced by chill. Not to be used in children under 2 years. If coughing or symptoms persist consult your doctor. Ingredient: Mentha haplocalys (peppermint oil) 57.3% v/v, Camelia sinensis (tea oil) 39.4% v/v, Daemonorops draco (xue jie, dragons blood) 2.07% w/v, Scutellaria baicalensis (huang qin, scute) 0.58% w/v, Cinnamon cassia (rou gui, cinnamon bark) 0.32% w/v, Glycyrrhiza uralensis (gan cao, licorice) 0.32% w/v.